The Rugby brand signals a refreshed, coherent and extended range for the future. It not only reinforces our CEM II packed products and our commitment to sustainable development, but also stands for improved reliability and availability. Find out more information about CEM II and blended sustainable cements. As well as packed cement the range also includes carefully-blended concretes and mortars offering exceptional quality, convenience and reliability, ensuring the right result every time. 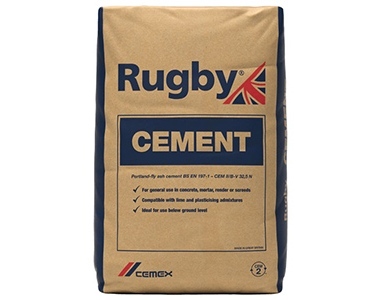 Top of the range, high quality cement - now available in 100% waterproof bags to keep it dry in any weather! 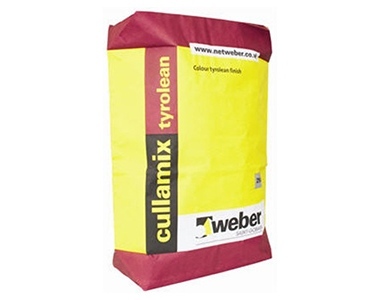 Can be used in concrete, mortar, render and screed. A general purpose cement for use in any building application, including concrete, mortar, render, screed or grout - ideal for use in smaller jobs and repair work. Our quality sulfate cement is ideal for use in concrete and mortar applications where sulfates are present - suitable for mortar and concrete below damp proof course. Suitable for applications where high strength is required - conforms to class 52,5N ensuring excellent performance, making it ideal for high-strength concrete applications. Sets hard within 1 hour - For use in applications where time is of the essence - ideal for concrete, mortar, render & floor repairs. Suitable for repairing concrete drives & paths. 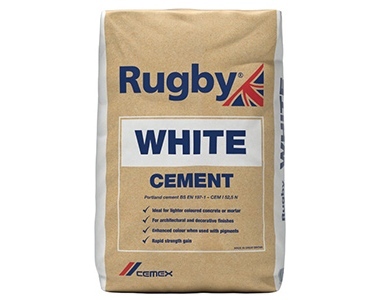 For architectural and decorative applications - our white cement is ideal for very light-coloured concrete and mortar applications. Also ideal to enhance colour with pigments. 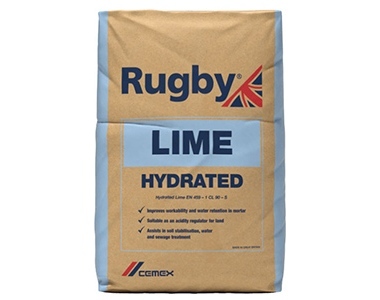 Improves workability and water retention in mortar - ideal for use in traditional cement/lime/sand mortars. Hydrated lime also provides better bond, reducing the risk of cracking. Tyrolean and rubbed-tyrolean finish - making it suitable for internal and external use in almost any environment, including coastal, town, suburban and rural areas. 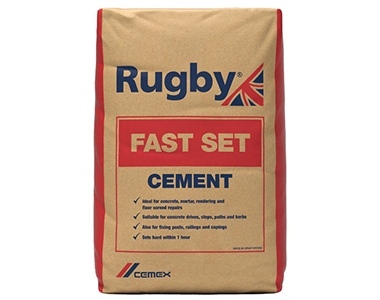 CEMEX Rugby Deep Fill Levelling Compound is a rapid setting and hardening, high strength, single part, cementitious smoothing underlayment incorporating recycled raw materials. It can be mixed up and applied as single units and is especially suited to larger projects where it is ideal for pumping applications and can be applied up to depths of 50mm. Rugby Post Mix is the ideal time saving solution for fixing fence posts and rotary washing lines in domestic applications. Post Mix is an equally time saving ideal alternative to mixing concrete for more commercial applications including fixing road signs and street lamps. Rugby Post Mix offers exceptional quality, convenience and reliability, ensuring the right result every time. Rugby Kiln Dried Sand is a natural, specially selected washed and dried sand designed for use as a jointing or grouting sand on concrete block paving projects. It has been designed to comply with the gradings given in BS 7533 Part 3 1997. Rugby Black Bitumen Macadam is a cold lay deferred set compound carefully formulated for ease of use and to give good results every time when either repairing patches, or refurbishing concrete. Find out more about our range of bulk cement, fly ash and cementitious solutions. Have questions about cement and CEMEX cementitious products? Check out our list of frequently asked questions and how it is used to find the answer you're looking for. Find out more about the most commonly used types of cement - including Portland and Composite.